The PR Lawyer: How are People Finding Your Business? Not only are people searching more online than via the yellow pages (which is old news), but they're both initiating and ending their searches online. I notice that you offer PR services, but I don't see mention of PPC and SEO. What do you do for clients that request such services? Hello Dennis. 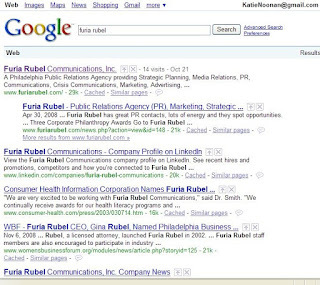 At this time, Furia Rubel outsources PPC and SEM but we handle SEO internally. As for yellow pages, I disagree, they're not "old news." Rather, they're offering new services that enhance SEM, PPC and SEO.